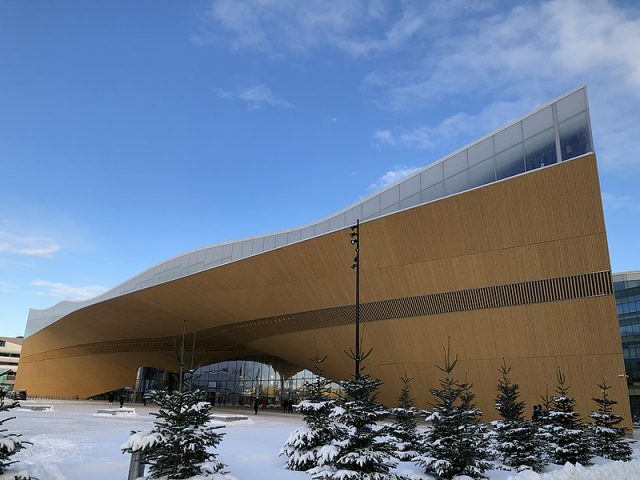 The new Helsinki Central Library Oodi – Finland’s largest and arguably most lavish – opened its doors to the public on Wednesday. Although it’s technically a library, it goes far beyond merely a place to borrow books. The facility features many spaces for meeting people and socialising, and offers the opportunity for people to participate in activities like readings, workshops and special events. Apart from books and other reading materials, Oodi is also equipped with 3D printing gear and sewing machines for creators, rehearsal rooms for musicians, a small cinema and spaces that can be reserved for a variety of uses. There’s also a café as well as the possibility to try out virtual reality technology. PG will note that Finland has a total population of about 5.5 million. I should get to reading your books. I’ve had Troll-magic on my kindle ever since I read here that you write fantasy, probably a year or two ago. Now, that’s just wrong. Public libraries are not to blame for the welfare State – the people that run them are. IMO the more artsy the architecture of a library, the less it is about the books and the more it is about showing off the spaces. This is not necessarily a bad thing for a library. The library has proven so popular that they’ve had a hard time keeping books on their shelves. I know you’re joking but when I zoomed in on the picture the shelves did look rather sparsely occupied and some were totally unused. I hope that the lower floors are actually full of books. Not joking. They couldn’t fill the shelves fast enough. 5,000 books were going out per day. I take your point. The end of that story did suggest that there is so much else to do there that a lack of books is not too important. However, it does look as if their book selection has gone a bit wonky. Where are all the books that no-one takes out but which nicely fill the shelves? Maybe they’ve paid to much attention to buying the books the readers want rather than those they are supposed to be reading? If you do that you really need a big book surplus to keep the shelves filled. I do wonder though if it should be called a library or whether we need a new name. After all it features things like 3D printing gear and sewing machines for creators, rehearsal rooms for musicians, a small cinema and spaces that can be reserved for a variety of uses. I have no objection to any of this – in fact I approve – it’s just that the term library seems inadequate. The libraries in Helsinki do a commendable job keeping up to date with what people want and need, but it’s not without its flaws. My wife requested a recent popular title and found that she was in line behind over 1600 people. I once waited a year for a set of language CDs. (Sorry if I didn’t mention I live in Helsinki.) Then, when you get a popular title, you only have a 30 days to read it before you start to incur fines (which you can pay when you’re ready; I’m happy to pay 20 or 30 euros once per year for such a thing). They also jettison surplus titles in the summer through massive book sales on the lawns of the libraries, which coincide with flea markets (it’s a big thing in Finland). But you’re right that staying on top of demand versus longterm needs is a challenge and requires both space and staff time. My sympathies to your wife. I guess that once a title reaches a certain level of popularity we shouldn’t expect the library system to supply it in a timely fashion: there must be a limit to how many duplicate copies they can buy knowing they will almost all end up in the next summer sale. At some point one has to bite the bullet and buy a copy (or at least check with friends to see if they have a copy to lend). We could call it a bath house 😉 Sorry, I was just amused because in the ancient world, bathhouses sometimes included gyms and libraries and restaurants and so on. A new word? “Entertainment complex,” perhaps? 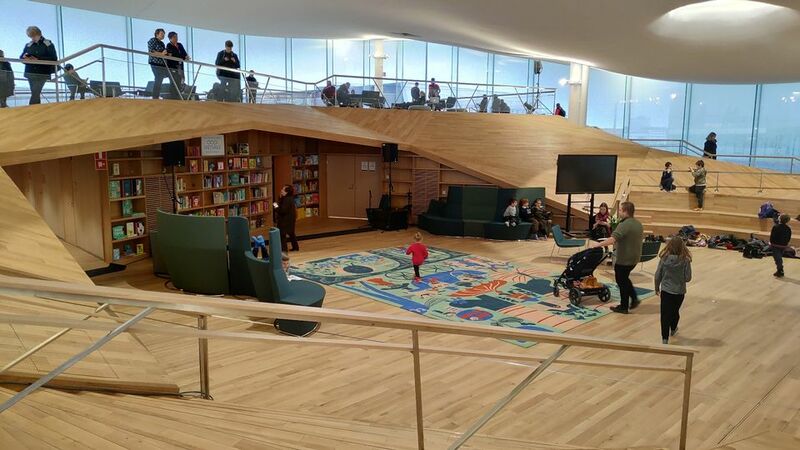 I was also worried when it looked like not enough architecture was devoted to shelving books, but I gather the library part isn’t the sole point. PG has at least one Finnish person following, though during the years I’ve never commented. I’ve been to Oodi once. I liked it, even though there weren’t many books then. I didn’t loan anything, but I did renew my library book and will loan hobby books (sewing, cooking, learning to play bass, things of that nature) in the near future. Also lookforwards to the cinema and coffee in a pleasant environment. Fictionwise I have a lot of e-books on my ancient kindle and several physical books on my shelf to be read. One of my closest friends, who lives less than a kilometer away from me, is Finnish and returns to visit his family every summer. Among the many things he has shared with me are the experiences he and a group of his friends have had traveling into those parts of Finland that were invaded by Russia during World War II and remain occupied. These trips are for the purpose of taking food, clothing and other supplies to the largely impoverished Finns who live there. I’m not Finnish, but I might be within a couple years’ time. I’ve lived here almost a decade. Part of my life here has been made possible by the libraries and the amenities they offer. I’m not Finnish, but I might be within a couple years’ time. I’ve lived here almost a decade. I wouldn’t have made it without the library.